In Australia most schools shut down for the end of term 2 break this week, North American schools have closed for summer and British schools close in a few weeks. While it's winter in Australia and Summer in the northern hemisphere here are some activities to try with your children that are fun, simple and can be done at home. While it's a post about holiday activities any of them can be used at other times. 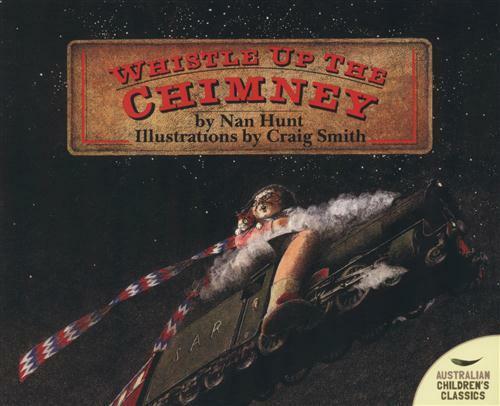 Craig Smith is a prolific illustrator who has been amusing and entertaining children for many years. He has illustrated 380 books. This includes trade and illustrated books, series, and book covers. He has a quirky, mischievous and humorous style that always seems to have surprises in each work. His artwork combines a wonderful sense of the absurd with attention to detail. As you read his complete bibliography you are quickly struck by just how many wonderful writers he has illustrated for and how many varied publishers. Craig Smith has been in high demand as an illustrator for almost 40 years. He estimates that this has required approximately 9,000 illustrations! He has won a number of awards; including The NSW Premiers Literary Award 1982 for Nan Hunt's authored book 'Whistle Up a Chimney', and a number of awards from the Children's Book Council of Australia (CBCA). The latter included an Honour Book for 'Where's Mum?' 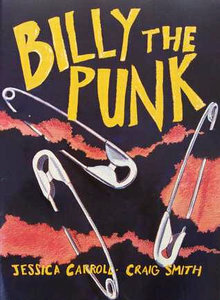 (1993), another for 'Cat' (2008), and a shortlisting for 'Billy the Punk' (1996). Craig grew up in the Adelaide Hills. 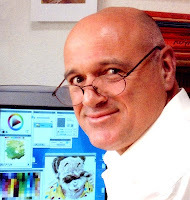 He has been a freelance illustrator since 1976. Like many artists and authors, for some of his early years he had part-time jobs to make a living - washing dishes in a restaurant, scraping rust off the Sydney Harbour Bridge, and doing drawings for advertising. One of the more interesting jobs he had as a young man was working as a nurse's aide in a hospital for the elderly. In that role he was able to observe the human body. This experience he suggests stayed with him and affected the way he has been able to develop characters in his work. He lives with Erica, in Melbourne and has four grown-up children, and four grandchildren. His most recent book has just been published by Allen & Unwin. It is called 'Where Are You, Banana?' (2013) and was written by Sofie Laguna. Roddy's dog, Banana, has disappeared! But when Roddy hears a wail from the drain, he finds an ingenious way to rescue his beloved pet. There is a free audio reading available for a smartphone or tablet via QR code printed inside the book. As usual, Craig's illustrations are vibrant and make the story come to life. With so many books to choose from, it's risky trying to select just a handful of Craig's many wonderful works. But here are some of my favourites. This was Craig's first book and was done completely in very fine line work and black and white. Crosshatched in a long, careful and laborious way, using an ultra fine technical pen. Sadly, it's out of print, but I'm glad to have it in my collection. Mrs Millie Mack lived alone in her little cottage, and as she sat down to knit at night she liked to listen to her fire going crickle crackle. But one winter, when she threw several pieces of wood from a 'bogey louvre' from an old railway carriage, there were very surprising results. I've always loved this book and have been reading it to children for over 30 years. The wonderful line and wash drawings of Craig Smith give Mrs Mack a personality that many will recognize. Curiously, when I discussed the book once with Nan's daughter she commented that Mrs Mack looked just like her mum. This is all the more surprising given Craig's comments in his interview about little contact with authors. This wonderful book won The NSW Premiers Literary Award in 1982. This book is just as funny today as it was almost 30 years ago when first released. Doug MacLeod's text and Craig's illustrations almost compete for the right to be more outrageous. I think it's a draw! 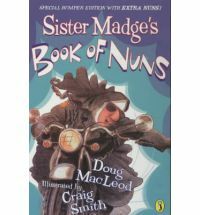 It is written in hilarious verse and introduces Sister Madge Mappin and other equally unusual inhabitants of the Convent of Our Lady of Immense Proportions. Craig's illustrations (the old and new version) make a significant contribution to this book of irreverent fun. Billy decides that he needs to look different. And he doesn't care that no one much likes his hair or his new clothes. While Craig makes great use of fine line in his books, in this one he uses colour to bring out the 'emotion' or mood of the story. In Craig's words, 'Billy walking to school is in a cool blue, to show his aloneness, or self-centredness. (Of course, other elements that emphasise this are the ‘from behind’ point of view, and the empty landscape). When he’s being yelled at by his teacher, the colour surrounding her is hot, angry, orange.' 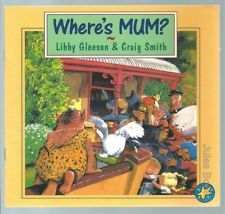 The book was shortlisted in the CBCA awards 1996. 'Cat' is about a day in the life of a cat of course. It is a very simple but animated story with few words. Craig's images are essential to the strength of the work. The life of a cat can be dangerous. 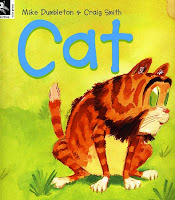 It is a great read aloud book for younger readers. It was a CBCA Book of the Year Early Childhood Honour Book in 2008. The following interview is one of the most interesting that I've done. As well as helping to offer an insight into Craig Smith the illustrator and person, it provides a huge amount of good practical advice for young illustrators. 1. Was your gift for drawing obvious early? Who encouraged its development? As a child and adolescent I had very average skills. However my older sister, Maire, has superb drawing skills, and these were apparent as far back as young childhood. My developmental pathway came about through visiting my sister at art school (SA School of Art in Adelaide), and becoming enthralled by the place in all its facets: painting, sculpture, film (rudimentary animation) and graphic design (especially typography). My portfolio was sufficient to become enrolled - I suspect it was partly because my sister was brilliant. However, like a lot of art students, I had a good work ethic, and the lecturers were good, occasionally inspiring, as were many of my classmates. Plus, the campus library with its contemporary art journals and illustration compendiums made clear the international standard we wanted to attain in the energized environment of Gough Whitlam and Don Dunstan’s (South) Australia in the 1970’s. Two last points; Life-drawing is the foundation skill for an illustrator. My lecturer George Tetlow was a terrific guide to how to do it. Lastly, I was lucky to strike a friendship with John Nowland, an inspired and very professional graphic designer. This friendship had – as well - all the aspects of a genuine mentor/mentee relationship. 2. 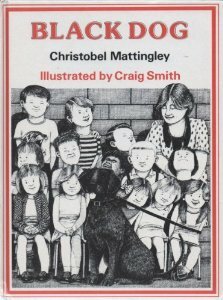 What books and illustrators were influential for you when you were growing up, and as an adult? Who inspired you, and perhaps what illustrators and authors still do? I’ve always enjoyed browsing and reading books. 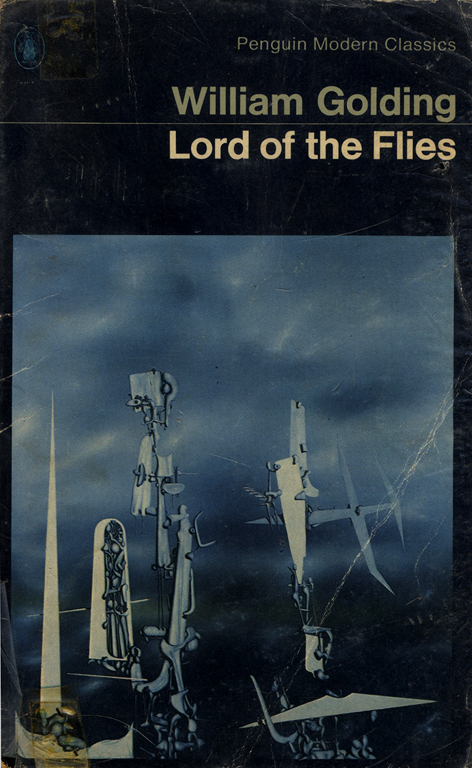 An example of a pivotal book was Lord of the Flies by William Golding – read at 13. I imagine this was a pivotal text for many. For the purpose here, I’ll concentrate on illustrators that inspired me, and especially around the period of art school, and the ten years thereafter – when most receptive to influence. First influence, being taught the principles of Swiss graphic design, exemplified in the book: Graphic Design Manual: Principles and Practice by Armin Hofmann. My first bible at art school. Secondly, New York graphic designer Milton Glaser. His book Milton Glaser Graphic Design was my second bible at art school. Next, by now I was drifting towards illustrative solutions for all my art school work. A number of Swiss/German artists became especially influential, Etienne Delessert, Heinz Edelmann, Roland Topor, Tomi Ungerer and most of all, the great Karl Friedrich Waechtar. They were especially influential by their exotic & peculiar Europeanness. Others included Ralph Steadman, John Burningham, Michael Foreman and Tony Ross in the UK. A very, very useful photographic resource was The Human Figure In Motion by Eadweard Muybridge. Nowadays, there is less that is influential but a lot that is charming and provoking; Leigh Hobbs and Shaun Tan come immediately to mind. 3. Do you have any preferred methods or medium? The medium is the simple part – arrived at by years of experience, and still steadily changing. Basically the medium is, a blending of gouache paint (useful for watercolour like effects – but less troublesomely soluble than watercolour), acrylic paint and acrylic ink. My illustration has always relied on an outline. This part of the illustration has changed most over years, from a precise opaque line drawn with a nib, and embellished with crosshatching - to nowadays an imprecise line still drawn with a nib, but the ink often much watered down and with little or no crosshatching. I rely on observing what happens as paint and ink dries, and trying to manipulate that. With regard to computer skills; you must have them. At the minimum to work professionally, you should have the ability to make basic alterations in Photoshop, as necessary, (to the scan files). Actually ‘painting’ for long hours on computer is physically stressful and eventually torturous, in a way that real painting never is. 4. How important is a sense of ‘partnership’ between author and illustrator? What is the key to the collaboration between author and illustrator working as it has for so many of your books? A publishing strategy is to partner people with the hope it works commercially. Occasionally it does, mostly it fizzles. In my experience, it does not involve directly working together at all – you just share a rapport, and attitude, with regard to the story. A different way of looking at it is, the rapport is actually with the editor. A good, supportive, thoughtful relationship with an editor is very motivating. I think it is the principal relationship. My working practice requires mostly being left alone. 5. What is the best response you've ever had to a book? The first book… Then being offered another one after that! 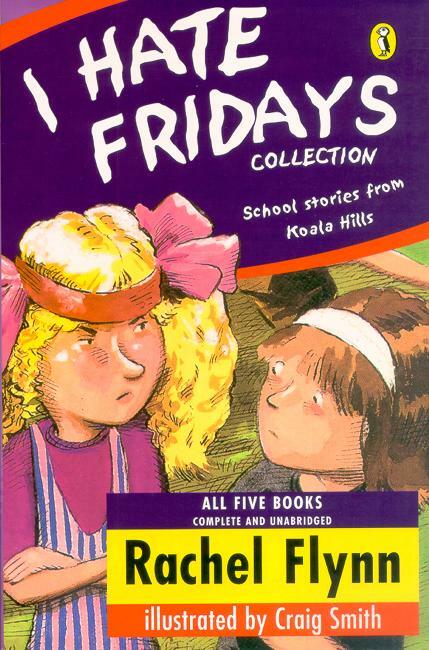 I’m always cheered by a response that I periodically get from the few readers of a series known generically as 'I Hate Fridays' by Rachel Flynn' (Penguin 1990 –1997). The readers are always girls who’s eyes shine with fun and brightness – they are clued in to Rachel’s acute, dry humour and familiar school characters. (These five black and white books may be my best work). Update: As I write this, I just received a notification that a recent book has a nice review in the NY Times (Heather Fell In the Water by Doug MacLeod, Allen & Unwin). That ranks! 6. Does the work of illustration get easier, or harder as your reputation grows and your list of great works lengthens? I think it gets easier to make judgements and decisions. I've had enough success to gain self-confidence. Not enough to think I've got it all worked out. 7. What's the most unusual request that you ever had for an illustrating assignment? The first that comes to mind would be What a Week! (by Robyn Ryan, Playworks). Requiring the child hero to be using a specific walking aid, and with some specific body movements characteristic of his condition. Another would be the requirement to picture the direct language describing child sexual abuse in Some Secrets Should Never Be Kept (by Jay Sanders, Upload Publishing). Perhaps the first drafts for the 'Toocool' series (by Phil Kettle, Black Dog Books), in which Toocool's sporting rivals were all in his imagination - drawn by anthropomorphizing the brick wall etc. Sad to say, this approach was abandoned. Another would be the video clip for 'The Lonely Goth' by Mick Thomas. The task involving planning, and timing, a series of images to accompany the song. I loved this task. However, the task of animating the song 'Insy Winsy Spider' for the TV show Here's Humphrey - all in one day. This task broke me mentally and also broke my enjoyment of animation. 8. Can you tell us a little bit about your new picture book, Where Are You, Banana? 'The dog, Banana' has that familiar doggy curiosity that has him lost, then found by Roddy - but hopelessly at the bottom of a road works (footpath) hole. Some quick thinking, and savvy use of toys, makes the rescue possible. It is a child size drama- no less moving for that. 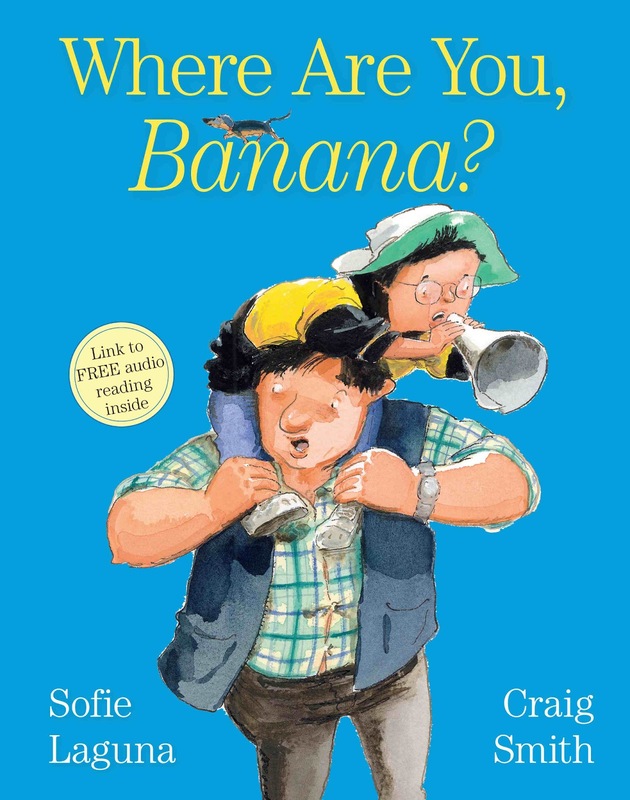 Using this book, the relationship between Roddy and Banana is bought even further to life - if you choose - by utilising a QR code to go to web narrations (audio) to listen while reading along with the story. This is an interesting use of groovy new technology, highlighting the warmth and liveliness of the narrators. Very exciting. 9. Do you have many new projects on the drawing board? No, not many in number. The years of abundant production in educational publishing are finished. • A picture book based on the Vietnam War. • A self-authored picture-book about a cat, on the theme of vanity. • Another is a venture into self-publishing – 'Doctor Frankenstein's Other Monster' (by Nigel Gray, CSI-Books) - because I use the book in school visits, plus it is a vehicle to develop an enhanced fixed layout EPUB ebook. The iBook version of this is just about ready to go. I recently had the opportunity to visit the Imperial War Museum at Duxford near Cambridge in England. I went with four of my grandchildren as well as my daughter and my wife. As a lover of planes I was excited to have the chance to visit this wonderful former WWI and WWII air base with many large hangars filled with over two hundred aircraft, as well as tanks, military vehicles and boats. The museum was opened in 2007 and has so many iconic aircraft, including the legendary Spitfire, Lancaster, Harrier and the fastest passenger plane ever, the joint British/French Concorde. But this is NOT a post about military weaponry! The thing that impressed me most about the museum was the way the whole site was planned to involve children in learning. It does this using varied methods, including play. The result was that in our party of 7 people, two 60ish year-old adults, a 36 year old mother, three girls aged 2, 6 & 8, and a 10 year old boy all had a wonderful time and learned many things. 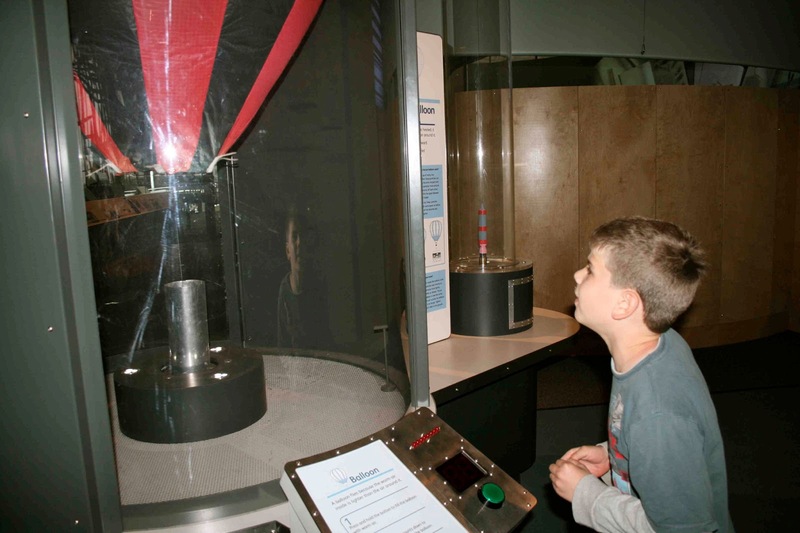 The main purpose of this post is to highlight how this exhibit used play so brilliantly. I was surprised just how much play was used. 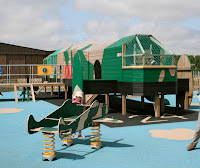 For example, IWM Duxford has one of the best playgrounds that I've ever seen. 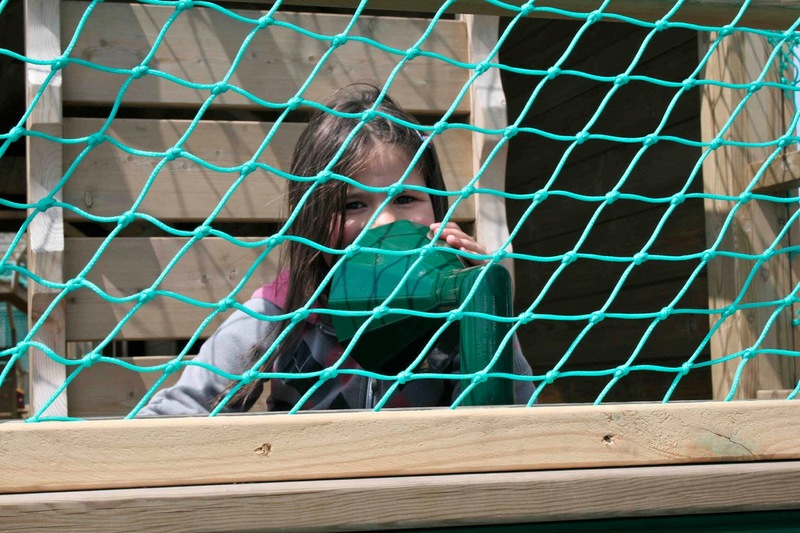 A playground for fun, but also a place to learn. 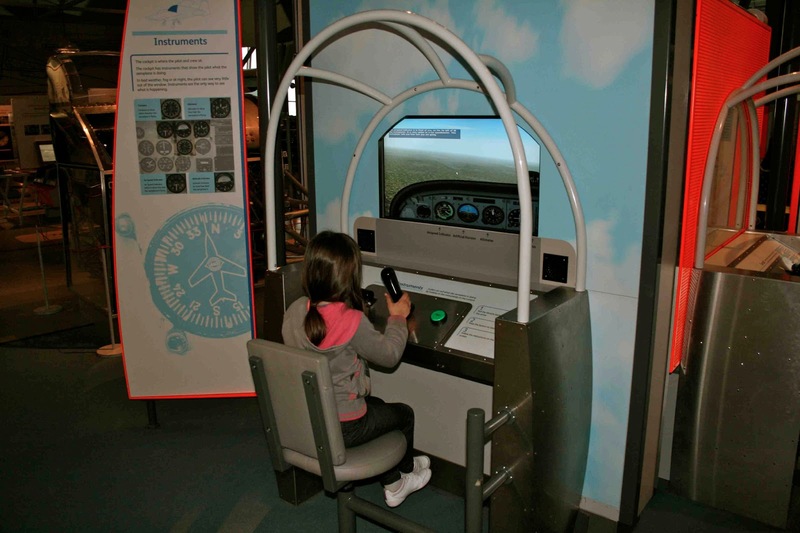 The Air and Space building also uses a wide range of interactive mechanical, automated and scientific apparatus that teach children about aeronautics and basic physics. All the while children use these they are having great fun with many complex apparatus. 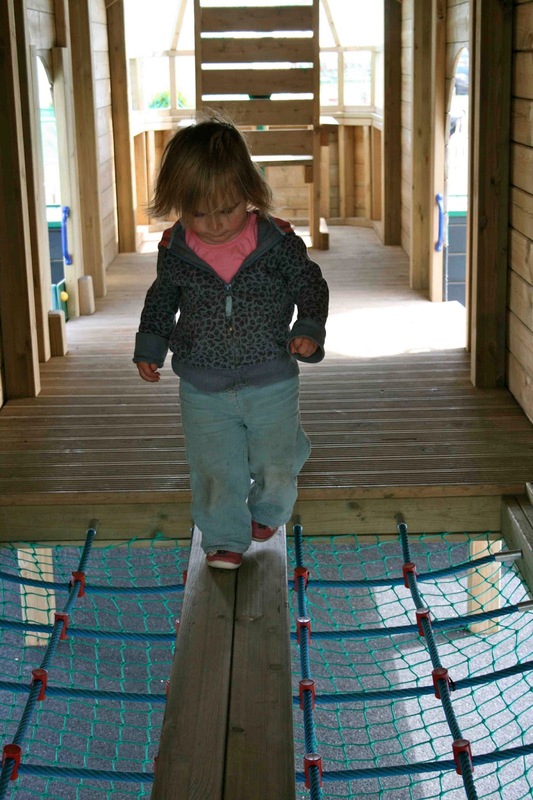 It was obvious that the designers of this place understood the role of play in learning. Play was as important for my grandson as it was for three of my granddaughters aged 6, 8 and 2. For each of them play was instrumental to how they enjoyed and learned from the experience. What's more there were just as many adults enjoying the same scientific apparatus and having great fun. The playground just inside the entrance had just two items, a replica plane and a control tower connected by a simple acoustic telephone. This was the ultimate piece of playground equipment. 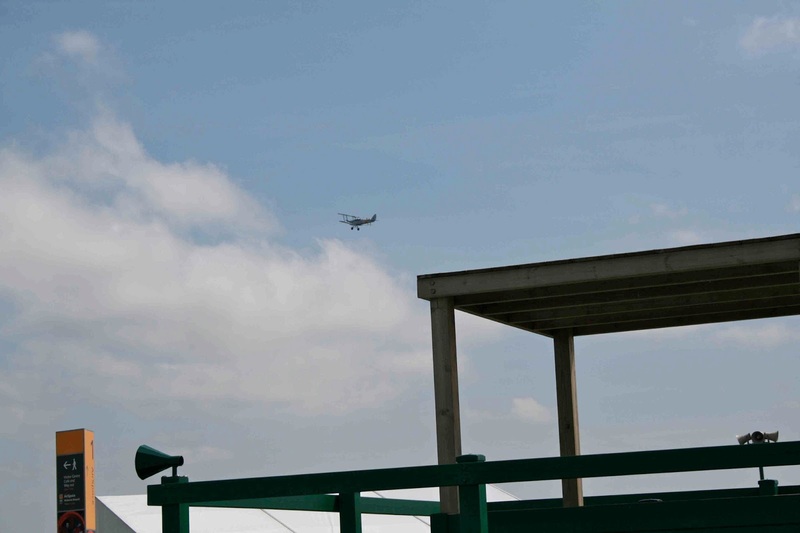 Its setting next to the runway offered the opportunity for one of my granddaughters to pretend she was the flight controller, giving directions to her sister who was the pilot. At one stage a WWI Tiger Moth took off on the runway as she called instructions to her sister waiting on her own take off. 'This is the best fun ever, ever, ever, ever, ever, ever, in every way'. 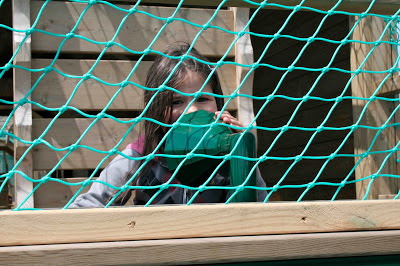 This playground was more than a place to run around and enjoy the usual slides and climbing ropes. This was a place to explore an aircraft on the edge of a famous runway before going inside to enjoy looking at planes and being involved in other interactive displays. Provision of knowledge was mixed with physical activity, kinaesthetic experience of parts of an aircraft modelled on the Spitfire and Lancaster bomber, and lots of fun! 1. Have an understanding of what people of all ages find interesting. 2. Using varied methods for learning, including observation of iconic objects, provision of information in spoken and written word, image (picture, video, computer programs etc), discovery learning, use of sound, and the situating of learning in exciting contexts. 3. Providing evocative objects and places. 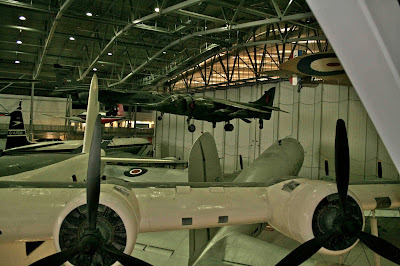 The experience of visiting IWM Duxford demonstrated for me why I stress so much on this blog that play, exploration, discovery, experimentation and firsthand experience are so vital for learning. It was a wonderful learning experience for all of our family members, and a lot of fun! 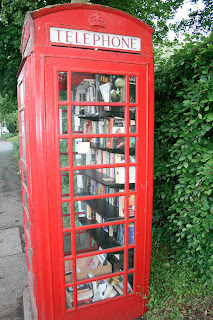 Library in a Telephone Box: British Ingenuity! Readers of this blog know how much I like libraries, so when I saw this library I had to share it with you. I'm staying near Little Shelford outside Cambridge in the United Kingdom at the moment and have been impressed by what must be one of the world's smallest libraries. 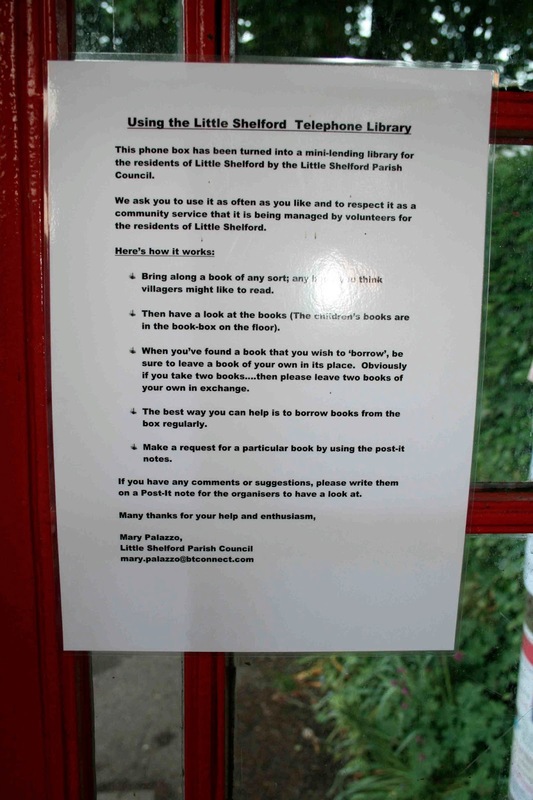 When the local council in this small town found that the famous British red telephone box was no longer needed, they asked local residents for suggestions concerning its use. A retired school teacher, Mary Palazzo, decided that it would be the perfect way to start a community library. She's the closest thing to the librarian which of course we know all libraries need! Mrs Palazzo sought the help of members of the Little Shelford book club to set it up. 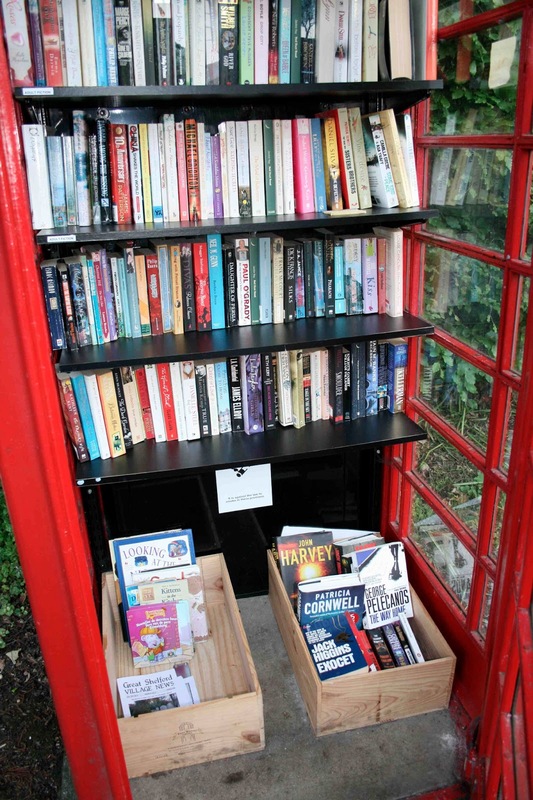 One resident added shelves to the phone box and many began to gather books. The books are organized in a number of broad categories to make it easier to find what you want. The library has a set of simple rules posted inside the box and requests for particular books are left on post-it notes. Town members are encouraged to take a book to read and to leave one in its place. The telephone box contains adult and children's books, including some wonderful picture books. 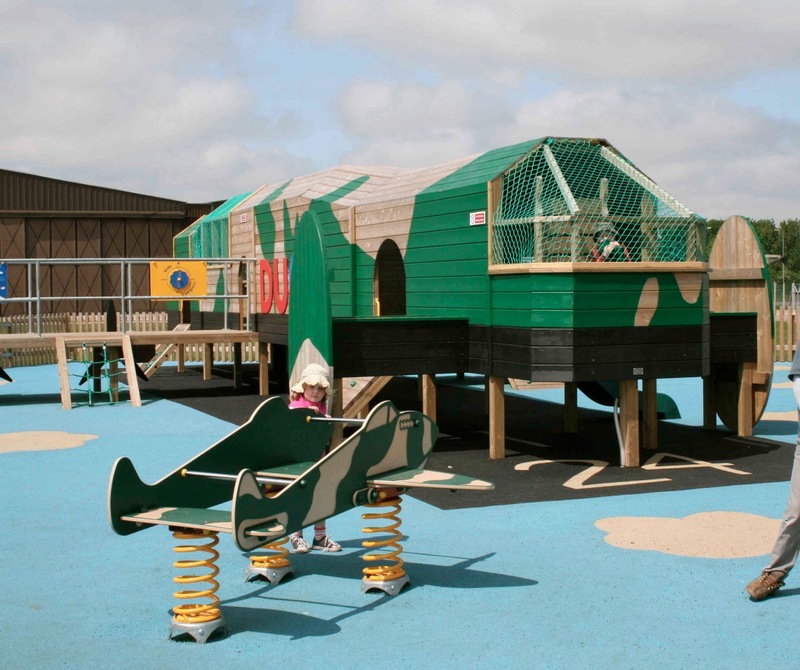 The library is aimed at Little Shelford’s 700 residents. Mrs Palazzo has found some books are more popular, with mystery and detective stories being the most popular. After two years it is still going strong. The project is one of a number of similar projects that have been started by local citizens in small villages across the United Kingdom that have red telephone boxes that are no longer viable as a public phone service in the age of the cell phone. 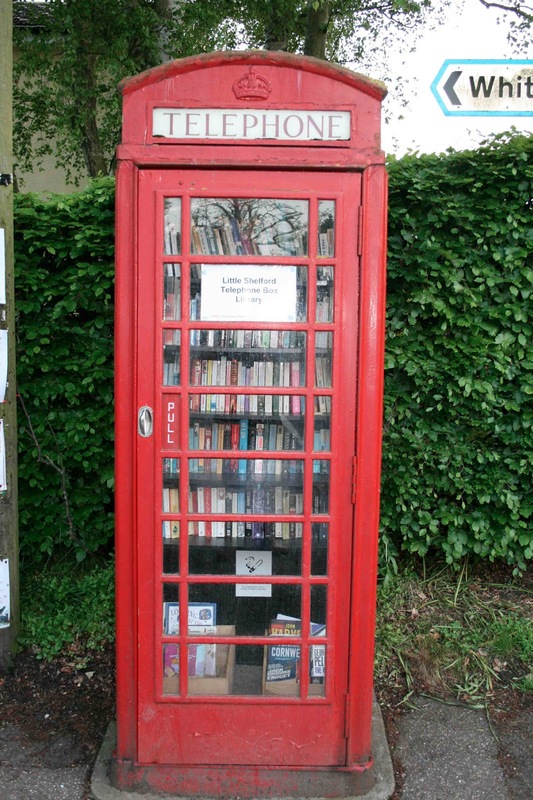 HT: Thanks to my daughter who spotted the Phone Booth library while she was staying in Cambridge and mentioned it on her blog.